Before the war, Eisenhower said the United States “had no armaments industry.” Since the end of World War II the nation found itself involved in a Korean conflict and was “compelled to create a permanent armaments industry of vast proportions. Added to this, three and a half million men and women are directly engaged in the defense establishment. 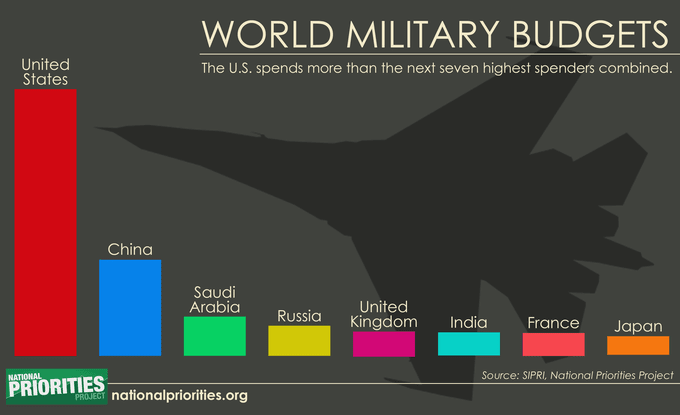 We annually spend on military security more than the net income of all United States corporations. “We recognize the imperative need for this development. Yet we must not fail to comprehend its grave implications,” Eisenhower warned. He said this in a speech before the nation in 1961. It is obvious, however, that the powers that followed Eisenhower into high office were not listening or were already bent on a quest for imperialism that has been unprecedented in the history of the world. While we have never openly declared ourselves as anything more than a police force for world peace, the United States has established and maintained a massive global military presence that rivals anything ever dreamed of by the old Roman Empire. And we flex our military muscle in every corner of the world. Chalmers Johnson in a recently published book Nemesis: The Last Days of the American Republic,” counted 737 U. S. military bases and more than 2.5 million personnel serving them on every continent. These statistics were calculated in 2005 and may not include new bases established in Iraq and Afghanistan. To maintain all of this global military presence, and to continue the wars in Iraq and Afghanistan, the Defense Department was expected to spend an estimated $1.01 to $1.35 trillion dollars in 2010. The Johnson report draws from government documents published in 2005 to show that the property owned by the military for housing the overseas bases is valued as high as $127 billion, with a total value of $658.1 billion for all of the military property both foreign and domestic. Even though World War II ended in 1945, we still maintain a military presence in Japan and Germany. We maintain military bases in North America, Latin America, throughout Western Europe, the Middle East, Central Asia, Indonesia, the Philippines, Australia, Greenland and Great Britain. In addition to the estimated 94,000 troops currently stationed in Afghanistan and 48,000 still in Iraq, the United States had over 40,000 military personnel serving in South Korea, more than 40,000 in Japan, over 75,000 troops in Germany, and nearly 17,000 naval officers at sea, according to the Defour report. The overall strategy has been to control the world economy and its financial markets and take over world natural resources. Looking at America’s vast military complex from this perspective, it is easy to understand why elected representatives in Washington, all of them heavily financed by secret outside financial interests, are reluctant to consider cutting the nation’s runaway defense budget. It is the very dilemma Eisenhower warned about. And it has happened right before our eyes.